Here’s a thing you might not know about Wagon Wheels. You can’t flush them down the toilet. I know this because when my mother was small, she was given a Wagon Wheel at a party, and she was too polite to say that she didn’t like them at all. So she took it, and them attempted to dispose of it by flushing it away. Flush after frantic flush, the Wagon Wheel kept floating back into view in the bowl, as my mother attempted to hide the evidence of her ingratitude. I never did find out what happened in the end, but evidently it scarred her for life, as she never bought Wagon Wheels for us when we were kids. Nowadays, there are more varieties on offer, of course – such as Mini Wagon Wheels, and the Double Choc version – which we shall look at here. 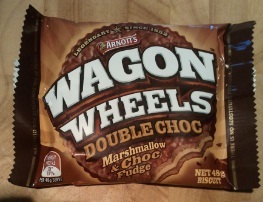 I have not looked at the flushability of the modern Wagon Wheel, however, as it seemed like the waste of a rather good biscuit, so apologies if you were hoping to see a video re-enactment of my mother’s shame. The Double Choc moniker is actually quite understated, and shows admirable restraint on the part of Arnott’s biscuiteers. 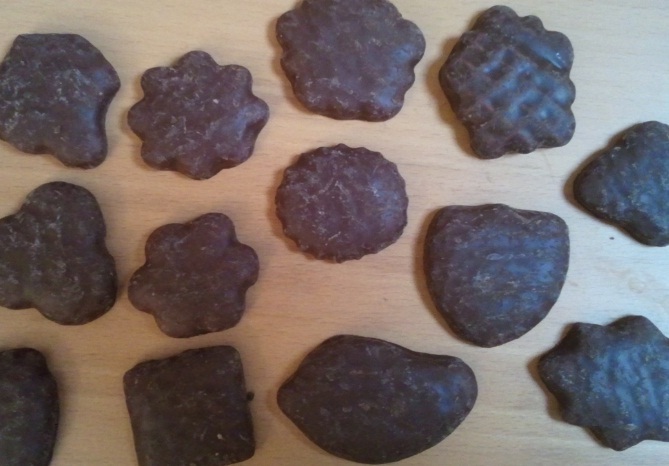 For the Double Choc Wagon Wheel contains no less than four choc components – the chocolate-flavour coating, choc marshmallow, a thin scrape of choc fudge and, to top it off, choc flavoured biscuits. 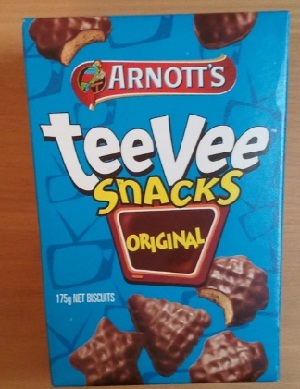 Perhaps Arnott’s should re-launch them as ‘Quadruple Choc’. The ‘choc’ part is important, as no self-respecting Wagon Wheel contains any actual chocolate. 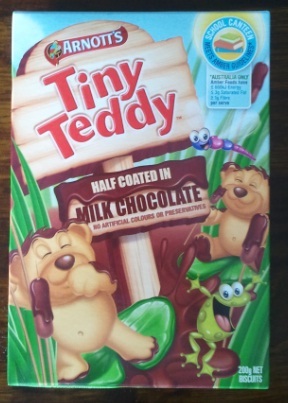 No, as the pack proudly proclaims, they are legendary since 1952, and back in those days chocolate hadn’t been invented – so instead various other substances were used to create the chocolate flavour. 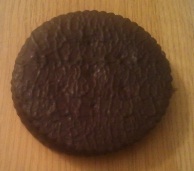 However, the Double Choc version of the Wagon Wheel is quite different to its conventional brethren. The regular one is a symphony of choc flavour, stale biscuit, weird mallow stuff and artificial jam – and is really exceptionally good. 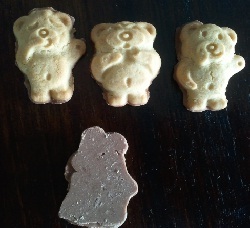 The Double Choc one, however, is quite different. The biscuit is far more crunchy, and the mallow more conventional. And they really do taste chocolatey – a bit like a chocolate desert, perhaps one of those ‘death by chocolate’ things you get in low-class eateries. It’s not really what you expect, but it is quite good – the spirit of Wagon Wheel still shines through, but the Double Choc version stands tall, delivering its own, modern interpretation of Wagon Wheel-ness. I’m going to give these seven out of ten. I was wearing my walking boots, as I thought they would be waterproof, but alas they were not. 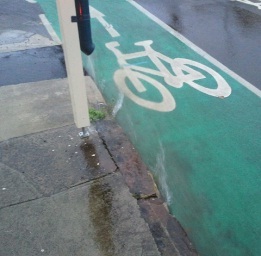 Or rather, they boots themselves were, but the action of pedalling caused a gap to appear around my ankles – a gap into which large quantities of water flowed, neatly directed off my waterproof over-trousers. There weren’t many other cyclists out there tonight, but I did see one who perhaps had a better idea – he was wearing board shorts and Crocs. I guess if your feet are going to get wet anyway, you might as well have shoes that allow the water to flow out, as opposed my my boots which gradually filled up with water. By the time I got home I was carrying my two own private puddles around with me – squelch squelch squelch. Notwithstanding my wet feet, the rest of me was warm and dry, and I did get a certain satisfaction cruising along, feeling very superior to the pedestrians scuttling along huddled under umbrellas and motorists enduring the inevitable gridlock that seems to accompany wet weather. Whilst I was (mostly) waterproof, however, my bike lights were not. This is a bug-bear of mine. 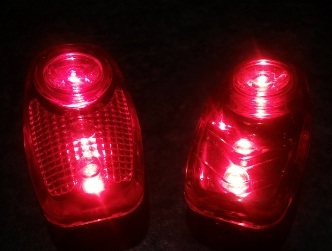 I have two lights on the back of the Radish, both reasonably expensive affairs from reputable bike shops, and both of which claim to be ‘waterproof’. Well, they are not. Take them out in wet weather, and water finds its way into the contacts. This causes them to switch on and off at random. It was frustrating enough to get back to my bike (which had been parked outside in the rain) to find one of the lights had evidently been on all day and the battery had gone flat. However, it was rather more concerning to arrive home and find that one of them had switched itself off during the journey, and the other had gone from solid to flashing mode. I don’t really want to be riding along in the dark with no tail lights in this kind of weather. Can anyone suggest a genuinely waterproof option? At the weekend I was playing in a concert with the Lane Cove Concert Band. There was quite a lot of logistical effort involved, as I had managed to secure the use of a set of timpani (kettledrums) for the concert, but they had to be transported across Sydney to the concert venue. 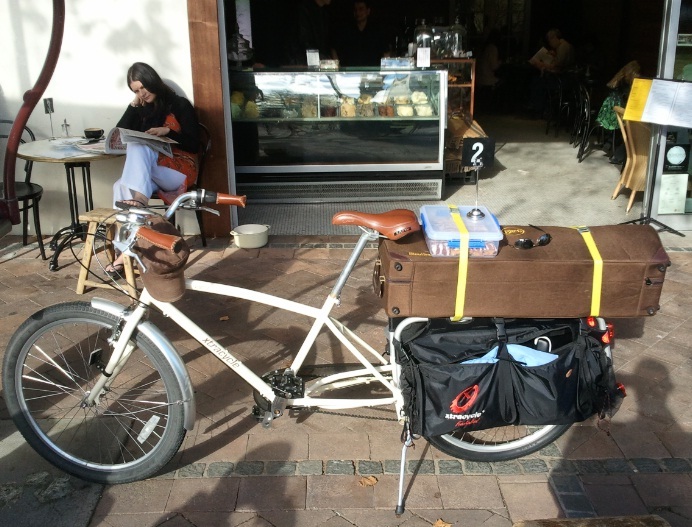 Before you get too excited, dear reader, no, I did not therefore load them up onto the bike and pedal them across town – although I did spend some time wondering if it could be done. We took the more pragmatic solution of hiring a truck, although I did ride over to where they were stored, together with my trombone and perhaps even more importantly the cake I had baked the day before as my contribution to the interval refreshments. I arrived a little earlier than the truck, so I had a cup of coffee whilst I was waiting, the bike working quite nicely as a table outside the bustling café . A few people did ask me about it, what I was carrying and so on. I think it was the cake that attracted their interest! Once my friend arrived with the truck we loaded up the timpani with no problems. I locked up my bike and we went off in the truck for the concert. It went really well; the second half was the Gunnedah Brass and they were really quite spectacular. Well worth going to hear if you get the chance. There was prolonged applause, and then an encore, which started to cause a little consternation for us – the timps had to be back by 6pm as the place they are stored in was closing – and Gunnedah were still doing their encore at five forty! The second the applause faded we rushed the four unwieldy drums out of the concert hall and onto the truck, and made a mad dash back across town. We got there with minutes to spare, and quickly unloaded them under the baleful eye of the supervisor on duty. My original plan was to take all my stuff with the drums, and then cycle home again from there, but in the rush to get the timps on the truck I left my trombone and other paraphernalia at the concert hall. We went back there in the truck, and I put the bike in the back so that I could ride home from the concert venue instead. When we arrived, I handed the bike to someone, and they put it down on the grass. However, the handlebars had spun right round when they had put it down, and when I got it loaded up I found there was a problem with the front brake – it didn’t seem to be working. I quickly realised that in twisting the steering so far the noodle on the cantilever brakes had jammed up against the frame and been more or less folded in half. I pulled it back into shape, wincing as I saw the metal begin to fracture at the bend. Still, this at least got the brakes working, so I set off. As I went along the road, another mechanical problem manifested itself. The rear mudguard started rubbing on the tyre. Very odd. I pulled it back into place, and continued, but for some reason every time I used the rear brake it seemed to cause the mudguard to once again start rubbing. I have no idea why this should be – I checked the rear wheel was fitted securely, and in any case if the wheel was shifting position under braking pressure then you’d expect the disc brake to start rubbing too.